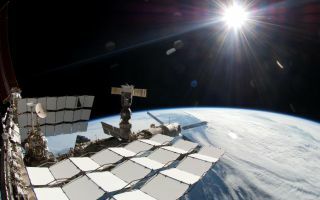 The bright sun, a portion of the International Space Station and Earth's horizon are featured in this image photographed during the STS-134 mission's fourth spacewalk in May 2011. The image was taken using a fish-eye lens attached to an electronic still camera. The bright sun, a portion of the International Space Station and Earth's horizon are featured in this space wallpaper photographed during the STS-134 mission's fourth spacewalk in May 2011. The image was taken using a fish-eye lens attached to an electronic still camera.